Value Cab/Shiraz blend from Penfolds! When Dr. Christopher Rawson founded a wine company named Penfolds in 1844, he could not possibly have foreseen the success this Australian wine giant was to achieve more than 150 years later. His house, known as Magill Estate, is the centerpiece heritage site of Penfolds today. 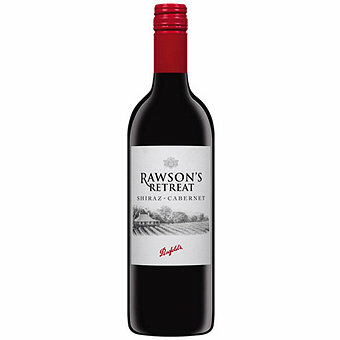 As the brand has expanded widely during the past two decades in particular, the need for more accessible everyday drinking wines has become apparent so the Rawson’s Retreat range of wines, affectionately named after the founder’s family cottage which he built in 1845, one year after he planted his first vineyard on the property, was launched. With the same attention to quality and value as the Penfolds wines Rawson Retreat brings ripe Australian varietal at super value pricing. This Cabernet/Shiraz blend is a prime example, sourced from vineyards in South Australia that Penfolds has long relationships with. This wine shows chocolate and ripe berry notes with spicy nuance. The palate has a ripe texture with cassis and vanilla notes that linger on the finish.